I took a bus from Nicosia to Paphos using the intercity bus service (www.intercity-buses.com) which departed from Nicosia’s Central bus station at 12pm. The bus only cost seven Euros and took around two hours, leaving me plenty of time to enjoy my afternoon and evening. 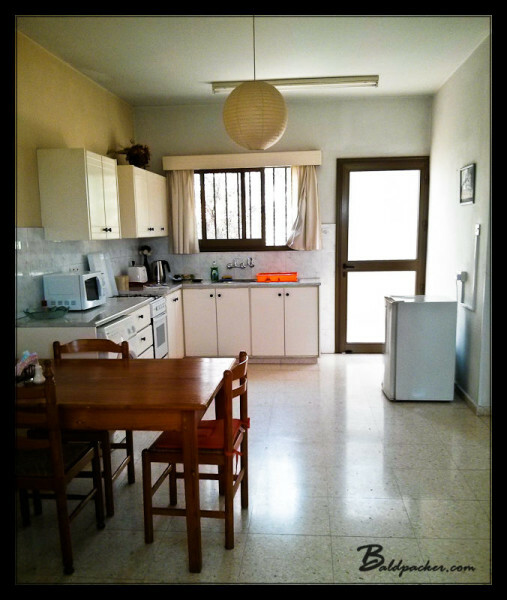 I had pre-booked a studio at the Arilena Holiday Apartments, an accommodation run by a local couple named Aris & Fytoulla, and when I arrived at Kavella bus station in Paphos I texted Fytoulla and she was nice enough to pick me up. I had hastily booked through an online travel site for 39 Euros per night but suspect better pricing is available if you book with Aris and Fytoulla directly through their website (http://www.arilenaholidayapartments.com/). The studio apartment was absolutely perfect for me. There was a large living area / kitchen, bedroom with double bed, and large bathroom and shower. Although the studio apartment is probably more intended for couples, it was great for me to spread out my things and relax and I could certainly see myself living in a retirement studio just like it one day. 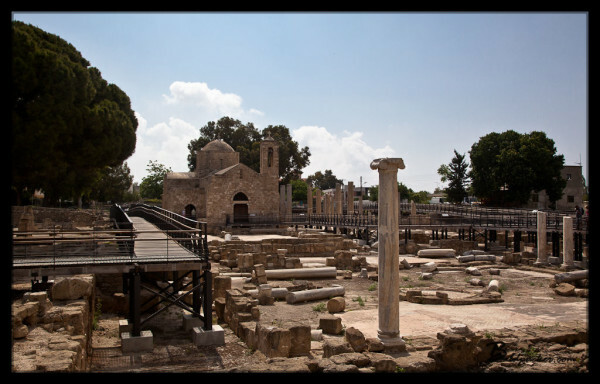 After settling into the studio apartment, I set out to explore Paphos. 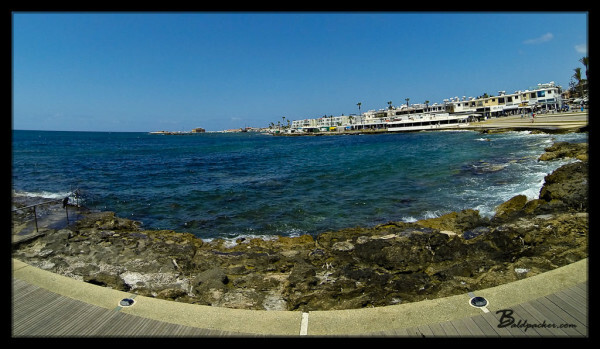 Like many European waterfront towns, Paphos’ main tourist drag was set along a boardwalk which ran parallel to the sea front. 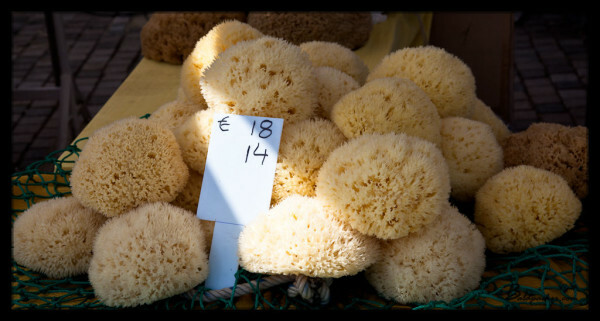 Since it was the last Friday of May, many vendors were setting up their sales booths which I expect remain in place throughout the summer selling sea sponges, nuts, dried fruit, sightseeing cruises and tours, in addition to the occasional carnival game. At the end of Paphos’ boardwalk lies the Paphos Castle, a Byzantine fort built to protect the harbour which was destroyed by an earthquake in 1222 and later rebuilt by the Ottomans in the 16th century. Although it is possible to enter the castle for €2.50, I decided my Euro coins were better spent on a Greek salad and Keo beer and soon found myself a restaurant with waterfront views to people watch and satiate my appetite. The next morning I walked back towards the Paphos harbour for breakfast. 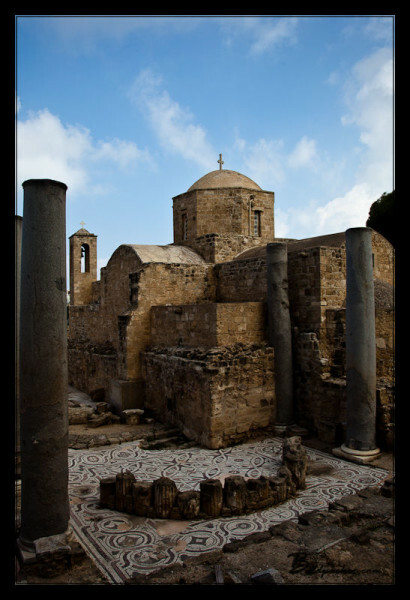 While walking to the harbour I discovered the Panagia Chrysopolitissa church, which was built in the 13th century over the ruins of the largest Early Byzantine basilica. Entrance to the church area was free and they municipality had built walkways allowing for safe viewing of a variety of colourful mosaics, many of which are still well preserved despite being open to the elements. I also saw St. Paul’s pillar, where, according to tradition, Saint Paul was flogged before the Roman Governor Sergius Paulus was converted to Christianity. Once at the Paphos harbour I found a waterfront restaurant offering a hearty English breakfast for only €2.50. Paired with a strong coffee and freshly squeezed orange juice, it was exactly what I needed before setting out to explore Paphos’ Archaeological Park. 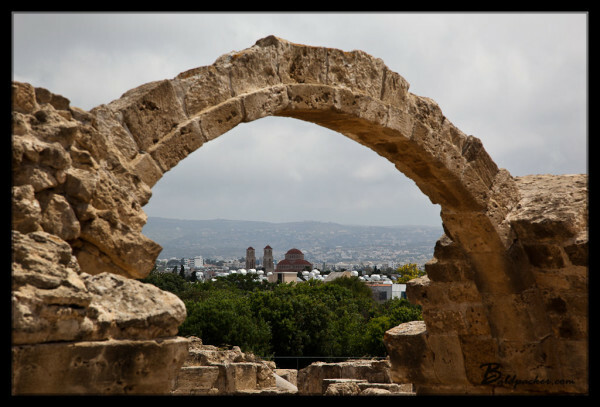 The Paphos Archaelogical Park, also known as the Kato Pafos archaeological site, was added to the UNESCO world heritage sites list in 1980. 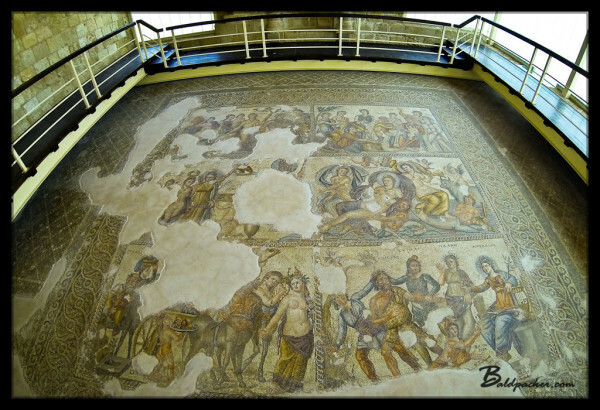 They have done a good job of preserving many of the monuments and mosaic floors from the Roman period and it is a must-see if you are in Paphos. 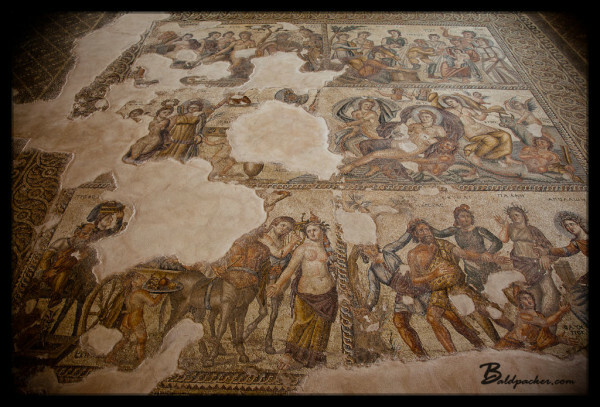 Entrance to the Archaeological Park was €4.50 but well worth the price of admission for the incredible mosaic floors alone. 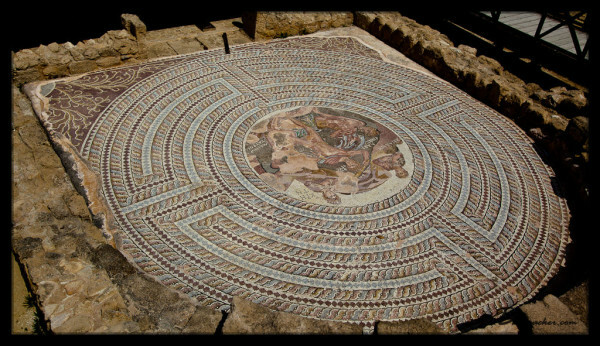 Many of the mosaic floors remain outdoors and exposed to the elements, but the best have now been covered by a building featuring elevated walkways to allow for protecting the floors and viewing from above. The Archaeological Park is quite large and I spent a couple hours wandering to see all of the sites. 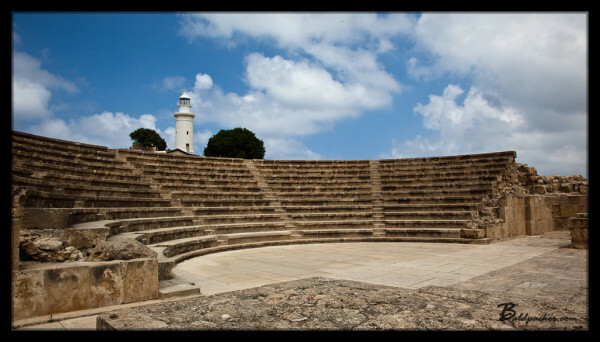 In addition to the mosaic floors, the Paphos archeological park features a small 2nd century Odeon built from limestone blocks. The Odeon is still used today in the summer for musical and theatrical performances and I imagine attending a performance there would be an amazing experience. After wandering the Paphos archaeological park for several hours I was beginning to get hungry and decided it was time for lunch. One of the best located restaurants in the harbor is the Seagul Restaurant as its placed just in front of the Paphos Municipal Beach. The title Municipal “Beach” is a misnomer as the area is essentially a wooden deck area with benches and docks that allow for public swimming. The Seagul menu has prices commensurate with its location but eventually I settled on an Italian sandwich for €7.50 and one of the more expensive Keo beers I had in Paphos. After lunch I walked south down the waterfront, past Alexander the Great hotel and on to SODAP Beach. Many of the “beaches” in Cyprus are actually rock or wooden shelves with ladders or piers allowing access to the water for swimming. SODAP beach had real sand, lounge chairs, and a rustic little beach bar where I was able to stop for a drink. The sun was hot so I was soon ready for a siesta and made my way back to my studio apartment for an afternoon nap. 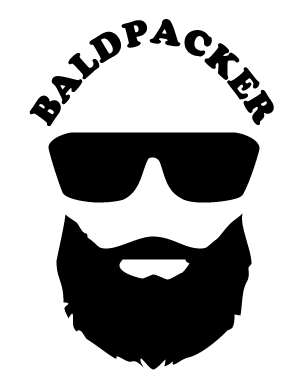 The perfect day for a backpacker who aspires to soon live the life of an old retired guy! A former colleague, George, who had been British special forces and then worked as a security superintendent with me in Yemen, had told me that he was going to be at his villa in Paphos and that I should get in touch with him when I visited. I gave him a call and since he already had a friend from the UK in town, we all planned to meet for dinner and drinks that night. Although both men were of retirement age, we were soon having beers at George’s favourite watering hole where he suggested I try a Brandy Sour, which he told me is considered the national drink of Cyprus. It was a delicious and sweet mix of brandy, lemon squash, bitters, and carbonated water, but sneakily strong enough for George to give the advice that one Brandy Sour was always enough. After afternoon drinks, we went to George’s favourite local restaurant where he said that locals tended to outnumber the tourists. We ordered the Meze, which was basically a large number of small flavourful dishes that kept being delivered to our table from the kitchen until we were stuffed. The old boys proved to me they could still handle their grog as we washed down the copious servings of food with three carafes of tasty house red and finished it all of with a shot of ouzo as a digestif. After saying good-bye to George and his friend for the evening, I made my way to Paphos’ “Bar Street” to watch the much hyped Carl Froch v George Groves boxing rematch. 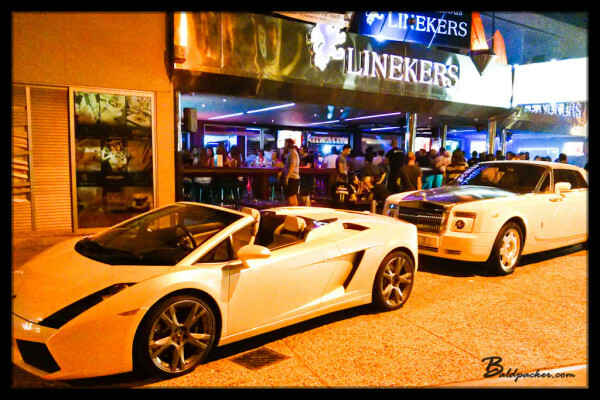 Apparently the Russian money comes out at night as in front of the Linekers nightclub there was a pearl white Lamborghini, pearl white Rolls-Royce, and two custom motorcycles that must have been worth close to six-figures. The coolest part of Linekers for watching the fight was that they had a DJ playing music, but also offered noise suppressing headphones for those who wanted to listen to the fight commentary. Although it is strange seeing a bar full of people wearing headsets, I thought it was great that the ladies could listen to the music and dance while the guys drank their beers and watched the fight (and ladies dancing). Before long there were girls in booty shorts dancing on top of the bar and I decided I better go home and get some sleep before I stayed out all night making bad decisions! The previous night George and I had agreed to meet at 9:30am and go to the Legion for breakfast. We were all feeling the effects of the house wine and brandy sours from the night before but still managed to meet up for a proper English breakfast and coffee to start the day. 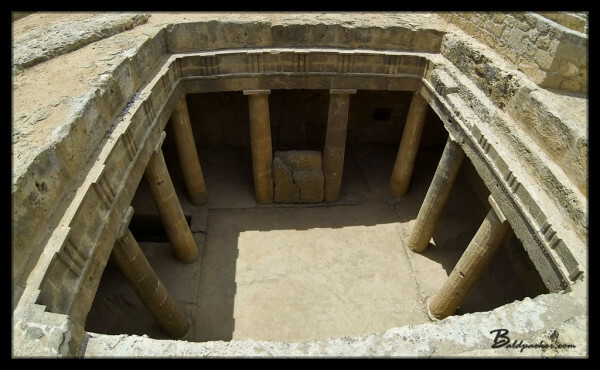 From there, George drove us to the Kato Paphos Tombs of the Kings where we paid our €2.50 to access the site. 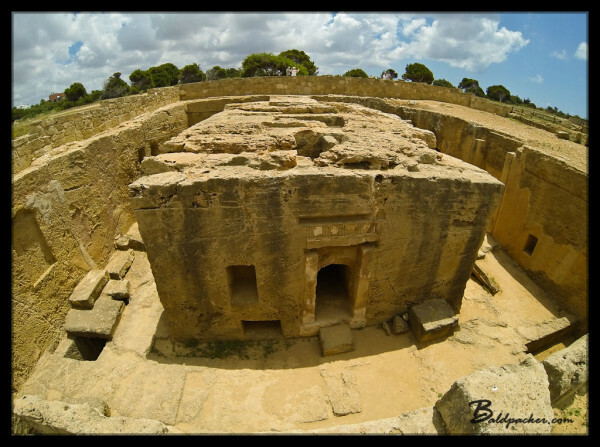 The underground tombs are quite impressive and date back to 4th Century BC. The tombs are carved out of solid rock and many are decorated with beautiful Doric pillars. Despite the name, high officials were buried in the tombs rather than kings, but it is still a site worth the price of admission if you have the time. After seeing the Tombs of the Kings George drove us to a rural beach towards Paphos airport that he apparently frequents with his wife. It was a rugged beach and the only real facility was a small “bar” where we could buy drinks out of a glass refrigerator. It was not very busy and it provided me with a good example of what the less crowded beaches away from Paphos’ usual tourist areas had to offer. From there, we drove back to town so George could drop off his car which would allow him to join us in the Sunday Funday beer drinking festivities. We went to Pinguins restaurant which has a great location right on the corner across from the Annabelle hotel and near the waterfront, making it the perfect place to enjoy the hot scenery while cooling off with a Keo (or two). Before long it was dinner time so we returned to the Legion where George had booked us in for the Sunday Roast dinner. The dinner was excellent but I think we were all quite tired from the night before so George and his friend said their good-byes and I walked back to Bar Street to try an Aphrodite’s Rock Beer, which I had seen available at the Robin Hood Bar. Aphrodite’s Rock is a small brewery near Paphos towards the Troodos mountains. I only tried one of their beers, an Irish Ale called “Lian Shee”. The Lian Shee had a great red colour to it but I found it very malty and sweet and after one, I decided to head back to my studio apartment for a good night’s rest. On my last day, I had an evening flight out of Larnaca. George had booked me an airport shuttle to Laranca via Limassol through what appeared to be a courier company and Fytoulla was nice enough to offer me a late checkout so I had until 3pm to enjoy my last day of sunshine in Cyprus. I once again walked down to the waterfront, but this time with the intention of shopping for supplies to take back to Yemen. 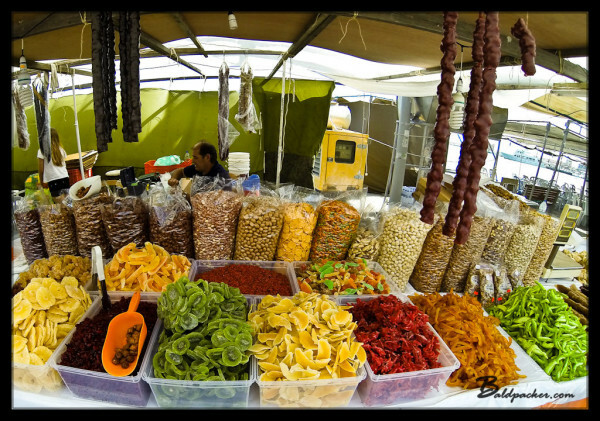 I purchased two boxes of Cyprus delight, which I believe are the same as the more commonly known Turkish delight, as well as local olive oil from Cyprus. While looking around the various shops I noticed huge variations in prices. The same box of Cyprus delight was €1.50 in one shop and €5+ down the street, so it is worth the beer money to shop around. 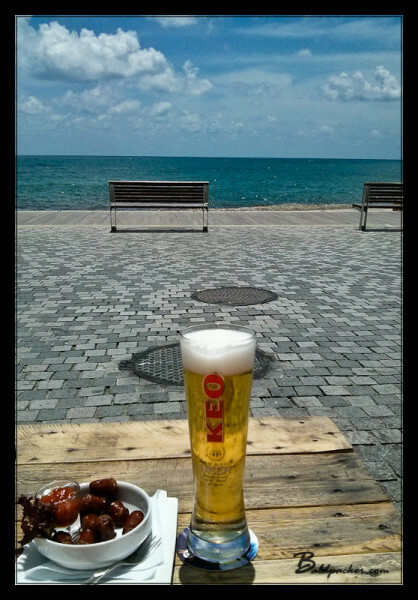 After completing my shopping I wandered back to the Seagul restaurant for a beer and Cypriotic sausages and then my favourite table at SODAP beach for one last Keo before returning to my Arilena apartment to collect my luggage. The airport transfer was late picking me up and the transfer in Limassol took close to an hour, so I was very concerned about making my flight in time. The driver from Limassol recognized the need for us to arrive at the airport as scheduled and decided to drive the 16 passenger bus 130+ km/hr the whole way. This was both frightening and comforting for me since I knew that if we did not end up in a burning wreck off the side of the highway I would arrive in Larnaca with time to check in and board my flight back to Dubai. In summary, I had a wonderful time in both Paphos and Cyprus and am eager to return and explore more of Cyprus in the future. Found your site through a Lonely Planet forum researching a trip to Cyrpus. I’ll be going solo if I do go, because I found really cheap flights via RyanAir. 🙂 The country does look amazing, but I’m just worried there isn’t really a standard backpacker scene. I don’t really need one to explore the country as I meet people everywhere I go, but was just curious if you met some fun people along your travels. Cheers mate. Happy you found me and hopefully you keep reading my blog! 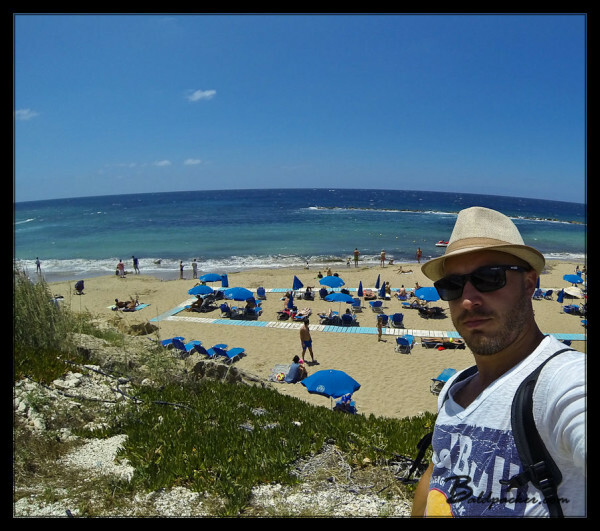 You identified the biggest problem with Cyprus for backpackers; that is, the lack of other backpackers! In Paphos I hung out with a couple old semi-retired types that I knew from work so I wasn’t out trying to meet people in Paphos but I didn’t see a lot of backpackers around. Paphos seems to be very popular with Russian tourists and older Brits. Ayia Napa is known as a “Night Clubber’s Paradise” so that may be a better place to meet under 30s. If you get to Nicosia I’d also highly recommend the Brewfellas Bar. I met lots of really friendly young locals there and would honestly travel back to Nicosia just to enjoy the great company and excellent beers I found there! 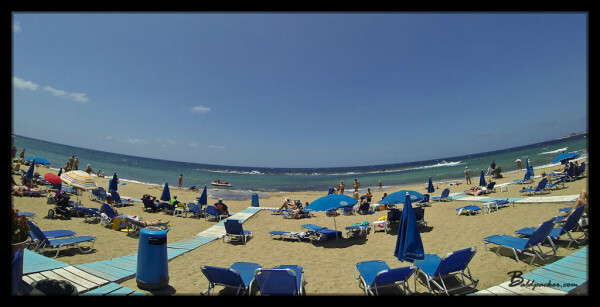 Hello just wondering if u can let me know if sodap beach is good for kids and if it’s the beach near Paphos gardens? Hi Tamar, I do remember seeing kids on the beach but as I am not a parent it’s difficult for me to say if it’s “good for kids” or not. I’m not sure where Paphos Gardens are but walking from the main tourist center it will be the second beach after Alexander the Great Hotel. I’d suggest just walking the pavement along the various beaches until you spot one that you think will be good for your and your family as they all have slightly different atmospheres and are not too far apart. I think the best beaches are actually outside of town so if you have a rental car that is another option I would recommend exploring.